Wow, wow, wow, that IS THE tone. I now must have one! Well done sir! A master piece of work!! Well, look what got delivered to me today! Beautiful bell-like chime from the pickup, great balance across the strings, and sustain like I’ve never experienced. What a work of art. What a beauty! I'll be ordering one, too. Wow, beautiful! Serial is #2, real treasure!! Congratulations Jim! What a beautiful instrument - and it's #2! Can you put up a clip so we can hear it? I have had some questions about the steels and figured I would post some answers here. The bridge spacing is fixed, on these steels. I made my horseshoe mounts work with this spacing. I can be flexible on the nut's spacing. The horseshoes are a real horseshoe and actually are a touch stronger than the originals. I can do left handed versions. I would not suggest a linear tone pot for Booh - Ahh's. Having an audio taper pot with a wide sweep will get the most range out of the steel. You can still get a good Boo-Ahh with a audio taper pot. A short scale 8 , and long scale 6 pattern will be made. I assume these will be ready around the 1st of 2019. I will try and work up another sound clip in the near future. Thanks, Phil. My skill level doesn't rival Todd's, so a clip from me won't do justice to the quality of the instrument, I'm afraid! I certainly have much love for this guitar. Mine's configured with concentric V and T controls that work just right for me. Todd, the string to string sonic separation on this, the first known recording session to feature the Frypan from 1933 has long haunted me. https://www.youtube.com/watch?v=7-62InekNS0 (and Hawaiian Ripple after it). I hear this quality in your recording, which IMO is a kind of holy grail of tone. Very exciting! Todd, you work is visually and aurally stunning. Thank you for raising the bar so high. I'm certain that one day, I will own one of your instruments. That is the magic that I’ve recognized in a Frypan’s sound—at times it sounds like the notes come out of nowhere from a different guitar. Very evident in some Andy Iona recordings. It is a phenomenon that I’ve never heard any other instrument replicate. I’ve always wanted a long scale Frypan. Thank you Andy. I sure appreciate your comments. We both share a lot in common, in our quest for quality in the steel guitar world. Thanks, Scott for posting this. A great history lesson, I have not known . Also for pointing out some of the similarities. I will try another recording here soon. I am trying to locate an inspiring piece in F#9, or possibly a 6th tuning. I wish I could plug a microphone into the ipad. I really enjoy the tone of this amp/ guitar combo at a slightly higher volume. But the microphone on the ipad just won't let me go there. Great playing on there. I have listened to Bobby's playing a lot. He is one of the best IMO. I have owned a few original frypans, and I do have a short scale prewar here at the shop that I am restoring for a friend. I am not really a "Sleep Walk" guy. I love the song, and enjoy hearing folks play it. But I have never been inspired to learn it, or to play it out. I assume you watched the whole video? I also assume you can throw yours on your shoulder and carry it like Bobby says. I really like your work. 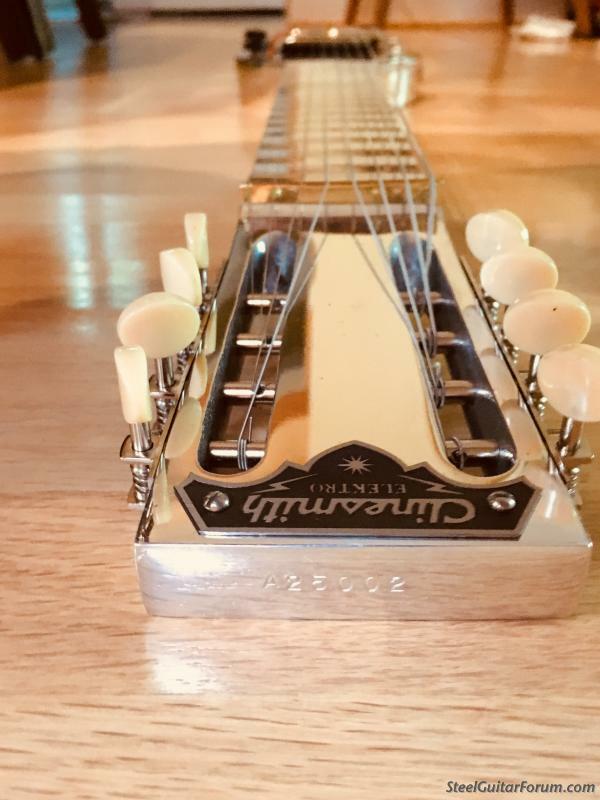 I have worked in the machine shop industry for the last 50 years and anyone who thinks making a lap steel with the quality and attention to detail yours have is an easy job, well let 'em give it a go! Great job. Put me on the list for a long scale 6 string pan. Thanks Steve, will do . WoW, Maybe I need one after all! Didn't know you had them done already. I'll bet these sell like hot cakes! What else do you get from a hot frying pan? As usual Todd has created a reproduction that is better than the original. My guess is that if and when the complete history of the steel guitar is written Todd will be a big part of that... At least one chapter. I already have two of his and was thinking of getting another of his Joaquin styled aluminum lap steels, but now thinking of an 8 string short scale fry pan instead. No hurry on my part as I can always get in line behind much better players who are far more deserving. My friend Margie is here really wanting to possibly purchase one of your beautiful fry pan lap steels, as shown. Would you be able to provide her with a price. I got to see Jim's guitar this weekend at HSGA in Fort Collins. What a work of art! Unfortunately I got so enraptured with Jim's bakelite Rickenbacher that I forgot to play the fry pan. I did get to hear it played along with a lot of original frypans and it certainly held it's own in the tone department. The price is $1800 plus shipping for the 8 String Frypan. Long scale 6's and short scale 8's should be ready around the 1st of the year.